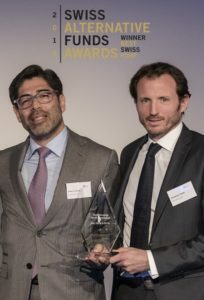 We are pleased to inform you that Multi-Strategy Sicav – Pendulum (Pendulum) won an awards last week at the Swiss Asset Management Day conference in Pfäffikon. We first want to thank the Swiss Finance Institute and the Department of Economic Affairs Canton Schwyz for organizing such a great event which was well attended with more than 400 investment professionals. We also want to thank HedgePole, Crossbow Partners and HedgeGate for organizing, nominating and selecting the awards which took into account a number of quantitative and qualitative criteria over a 4-year period (2012-2015). During that 4-year track record, Pendulum annualized at +6.26% net return with a monthly annualized volatility of 3.05% and a Beta to the MSCI World of just 0.14. We will continue to work hard to try to replicate this type of performance which has so far met our risk adjusted returns and correlation expectations. Last but not least, we want to thank our investors and all the Notz Stucki teams involved in the management of Pendulum including the Risk, Compliance, Trading and Back-Office teams.